Step right up and pay your dues to witness a performance that transmutes time: a barbaric banquet boasting aberrant bodies and dusky denizens from exotic cultures — ALIVE!! Hurry! Hurry! Hurry! Behold the wonders of Injun rarities Monique Mojica (Guna and Rappahannock) and Barry Bilinsky (Metis/Cree), for a limited performance run. The spectacle will be held at the b current Performing Arts Co. in Wychwood Barns at 601 Christie Street for your amusement, July 13 – 22, 2018 at 8PM with blankaroo nights (PWYC) on July 15 and July 18 at 2PM. This Ten-in-One odditorium will highlight Izzie The Invisible Woman- an Alchemist, FlimFlam Sam – The Outside Talker, The Authentic Cockboy, Vibora de los Veinte Venenos and a full cabinet of curiosities for your viewing pleasure. Hurry, hurry, claim your seats and observe these exotic stories in Tkaronto’s very own sideshow before their next jump. With freakish alchemy and chaos, there is only one way to find out if Izzie M. will be able to pull-off her own disenfreakment! It will leave you gasping in delight, awing in amusement, defying your wildest dreams — and nightmares! Following the blowoff, visit the concessionaire to purchase your souvenir parlour card of Izzie M. (Monique Mojica) & FlimFlam Sam (Barry Balinski). These rare collectors items shall never be reproduced. The cascades are bubbling, so do not wait! Nab your passes today for only 15 aces ($), it’s bound to be a madhouse! Chocolate Woman Collective is comprised of senior Indigenous artists, artist/scholars and their collaborators, and was formed in 2007 to research and create the theatrical performance, “Chocolate Woman Dreams the Milky Way“. These accomplished artists are brought together by our shared interest in research, exploration and practical application of Indigenous aesthetic principles in all areas of the dramatic arts, in theory, process and practice. Chocolate Woman Collective is inter-disciplinary, cross-cultural and inter-generational. We are pushing the parameters of our respective art forms as we devise culturally specific dramaturgies from which to build Indigenous performance. For more information on the Collective see our About page. Head Wrangler Nida Haroon helped bring the visions of Izzie M to life! Nida is a theatre production manager and stage manager based in Toronto. Aside from occasionally diving into the indie theatre world, she spends her time as a Production & Operations Assistant at Young People's Theatre, Assistant Production Coordinator at Harbourfront Centre, Production Assistant for the City of Toronto Cultural Events, and Stage Manager at Toronto City Opera. 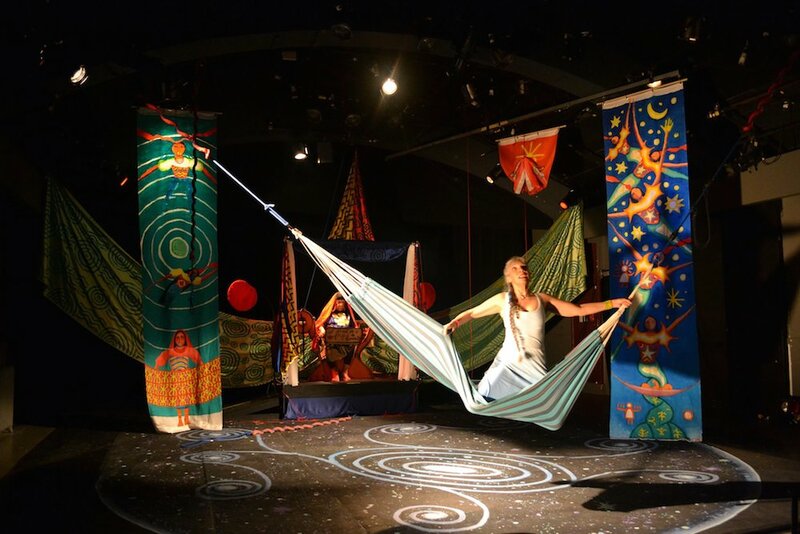 Notice & reminder: today's performance of Izzie M: The Alchemy of Enfreakment has been moved to 2pm. Sorry for any inconvenience this may have caused. We look forward to welcoming you for the final performance. 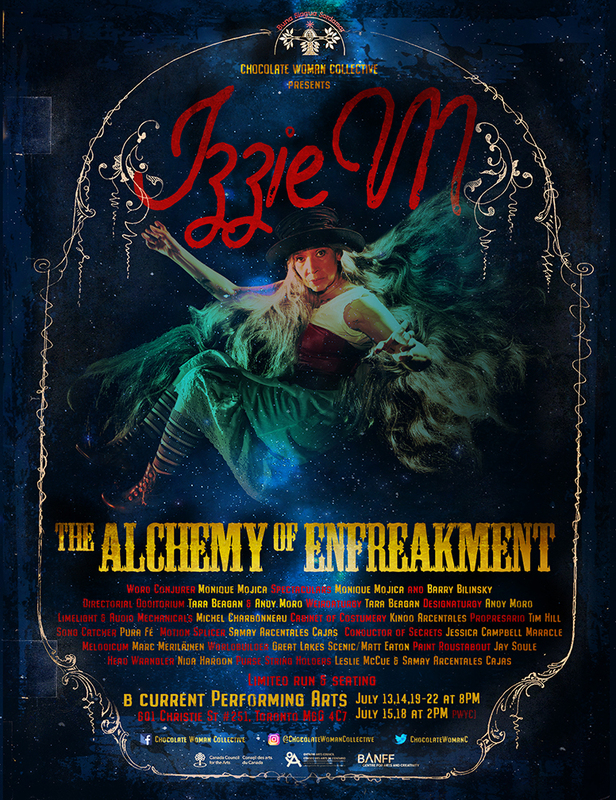 CONTEST: Find the Side Show Performer to win 2 tickets to Izzie M: The Alchemy of Enfreakment! Copyright © 2019 Chocolate Woman Collective. All rights reserved.